Playing Card manufacture: B. Dondorf (1833-1933), Frankfurt am Main, Germany. 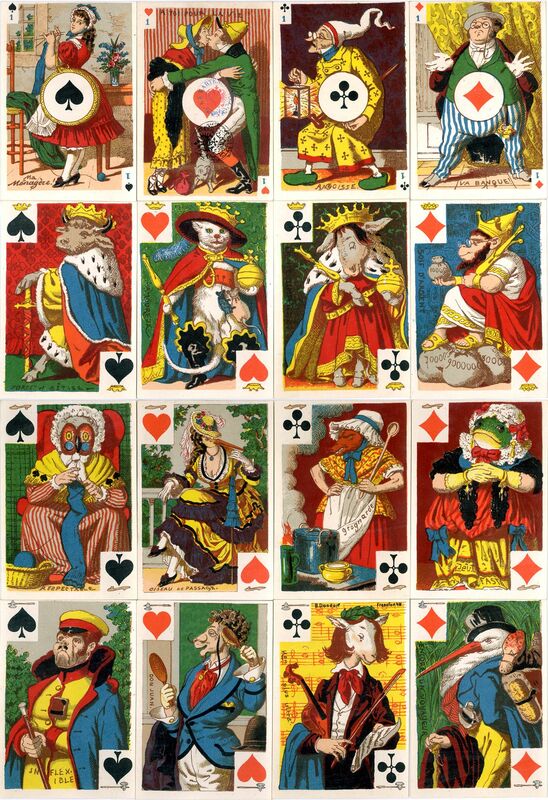 Cartes Comiques is an early deck published by B. Dondorf, adorned with burlesque caricatures by an unidentified artist on all 52 cards. 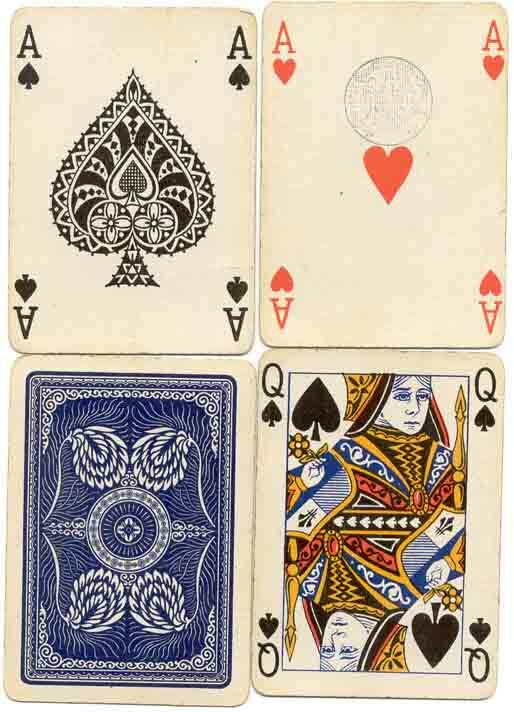 The Four Aces and Court cards each show full-length figures printed by chromolithography in six colours, along with the standard French suit symbols. 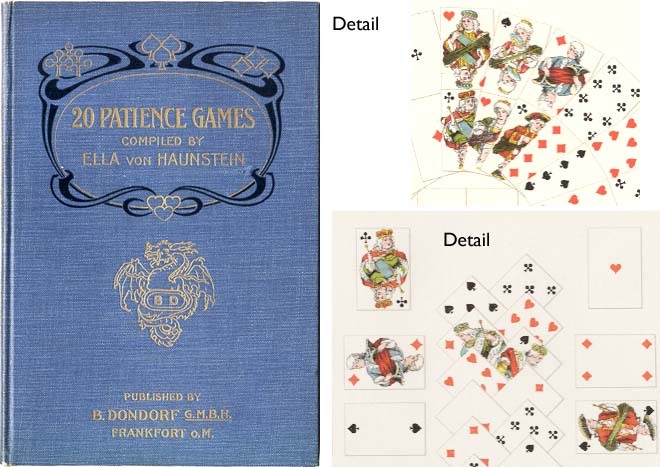 There are no indices except on the Aces and numeral cards. The numeral cards 2 to 10 are illustrated in two tones with the suit symbols superimposed in black or red. 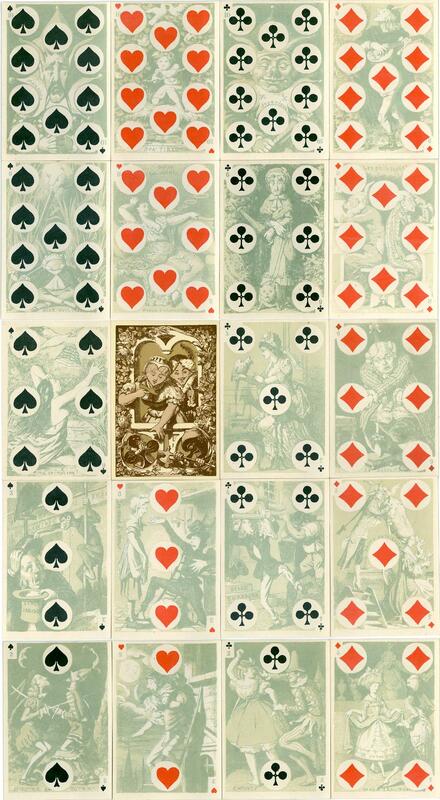 Above: the Four Aces and 12 Court cards from Cartes Comiques, published by B. Dondorf, 52 cards (no Joker), printed by chromolithography, square corners, 65mm x 94mm, c.1870-1888. 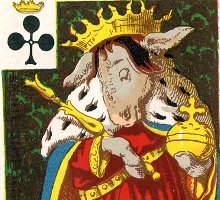 The maker's name appears on the Jack of Clubs as "B. Dondorf, Frankfort a/M" and the cardboard case has the inscription "Cartes Comiques, Tarotè Rouge et Noir. Entières No. 361". Images courtesy Barney Townshend. Above: the numeral cards from Cartes Comiques, published by B. Dondorf, 52 cards (no Joker), printed by chromolithography, square corners, 65mm x 94mm, c.1870-1888. 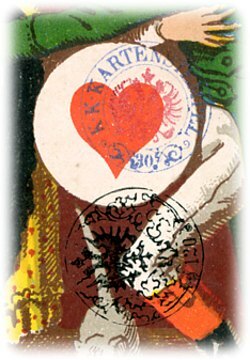 The reverse shows Cinderella and the Prince in a casement window, their faces forming a Heart and Diamond, with Club and Spade in vignettes below. Images courtesy Barney Townshend.